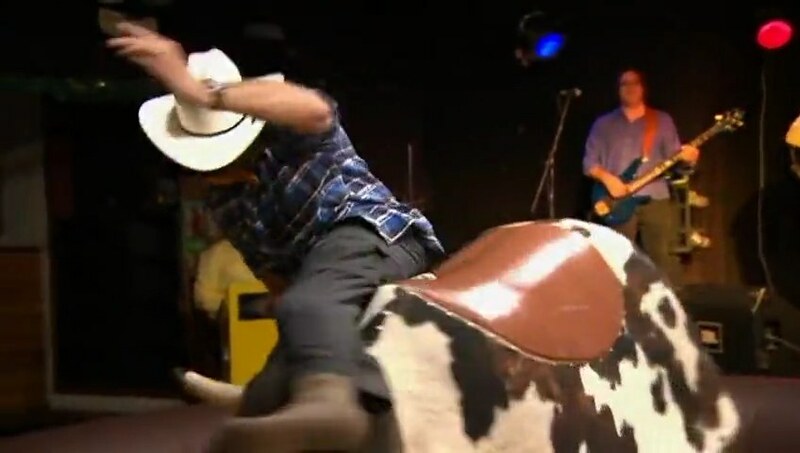 Teams hop onto one of two, 14 hour bus rides to Banff where they must ride a mechanical bull for a combined 60 seconds to receive their next clue. However, teams can keep going and the one with the highest accumulated time will get a bonus prize. Paul & Steve and Shane & Andrew are on the first charter bus leaving at 8am and they get to Wild Bill’s Saloon in Banff to start. The Cops are having a little easier time and are determined to win the bonus prize. 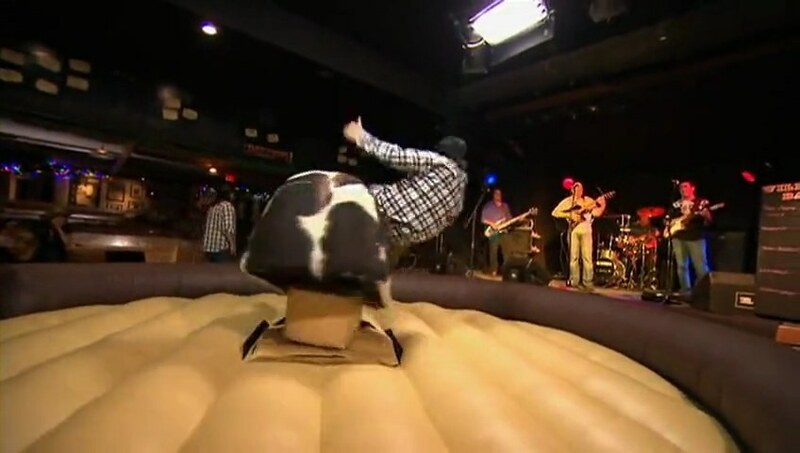 The 2nd bus, leaving at 9am, manages to allow the other teams to catch up and the five teams take turns on the bull. With Paul & Steve giving up and not wanting to possibly injure themselves, the other teams make it a point to just beat their time. Shane & Andrew win the bonus prize, a 30 minute head start at the next Route Marker, Junk Yards at Rundle Mountain, which opens at 8:30am. The Cops head in at 8:30 (with the others having to wait until 9am) and they find the Road Block. In this Road Block, teams must scale a 25m frozen waterfall to retrieve their next clue. Shane goes and has no problem finishing. Later, Paul manages to pass Jo at the waterfall with Joseph right behind and Lucy struggling, but soldiering on. 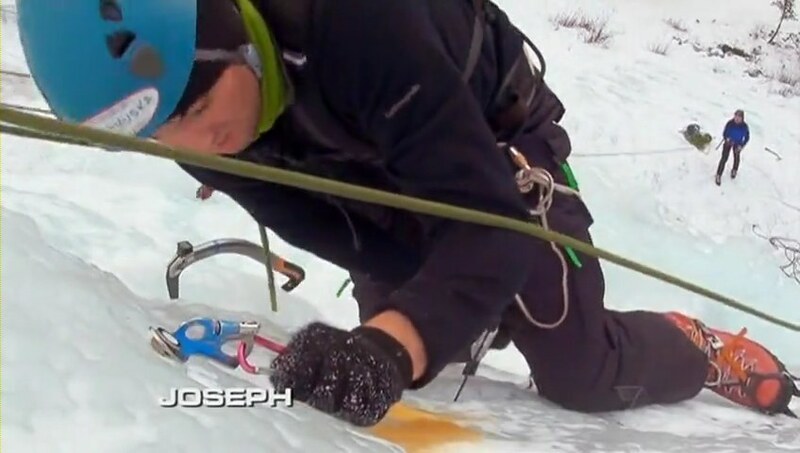 Teams must drive to Lake Louise Ski Resort for the Detour.In Search, teams must use a avalanche rescue beacon to find a transmitter in a backpack in a marked area, dig it up and exchange it for their next clue. In Ski, teams must complete a slalom course. The Cops choose Ski and finish. Paul & Steve choose Search, but have trouble finding anything. 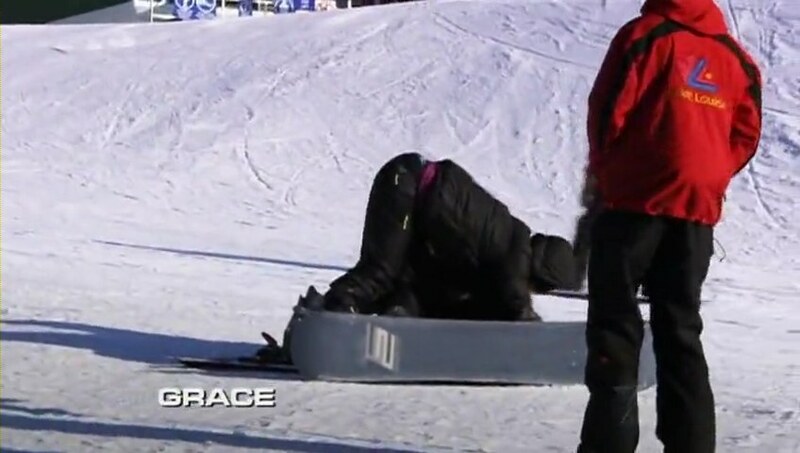 That allows Joseph & Grace to finish the Ski Detour 2nd. Paul & Steve decide to switch Detours and manage to catch up to Michelle & Jo. And Lucy & Emilia, though trailing behind, manage to do what Paul & Steve could not and finish the Search Detour. Teams head to the next Route Marker where they will help lead a dogsled team around a 3km course until they find their next clue. 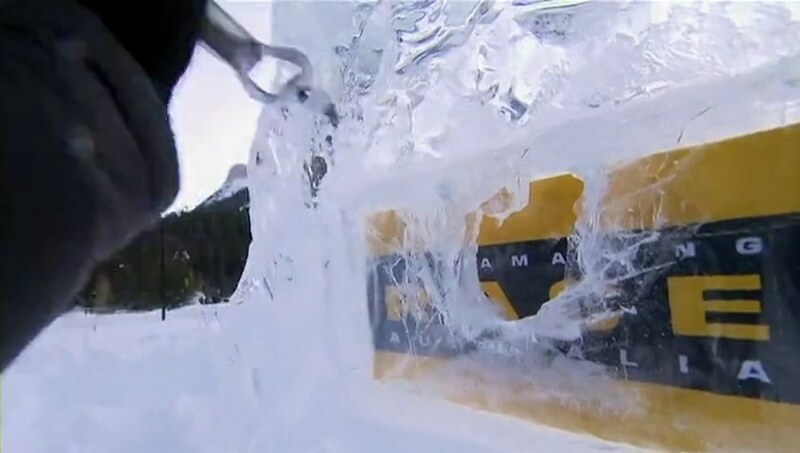 Teams must head to Chataeu Lake Louise where they must retrieve their next clue from the bottom of an ice sculpture using the tools provided (including a single high heeled shoe… a hunner perhaps?). The Cops maintain their lead and head to the Pit Stop at Banff Springs Hotel where they officially check-in 1st and claim a $10,000 prize. While Joseph & Grace step on the Mat 2nd, Paul & Steve and Michelle & Jo get to the ice sculptures together. 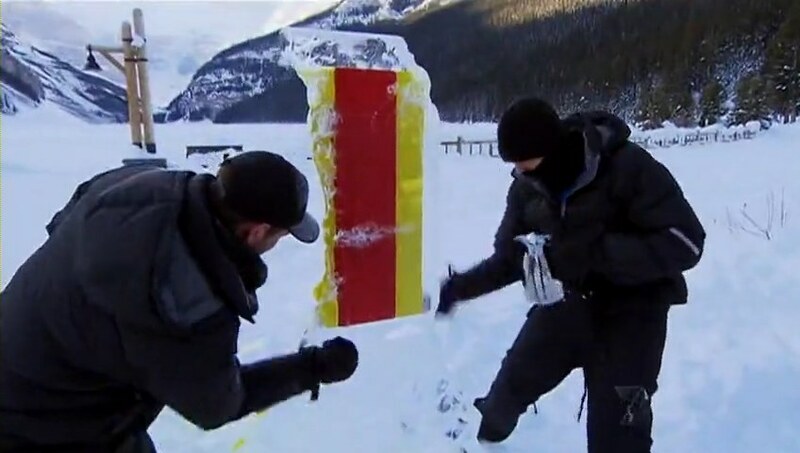 But Paul & Steve start hammering away at the huge Race flag part of the ice sculpture, likely because they chose one of the sculptures (probably the Cops’) that was already missing a clue. While they knock it over, Michelle & Jo chuckle and easily get their clue and head off to finish 3rd. Steve finally sees the other sculptures down the way and they laugh at their idiocy, but that can’t keep them from escaping elimination by finishing 4th. Not so lucky though are Lucy & Emilia as elimination finally catches up to them as they finish in last. Well, this three week break was pretty long eh? Or should I say, “pretty long, yeah?” I don’t know about this three night finale event, they might as well have just aired during the Olympics or, I don’t know what programming Seven has in the next two weeks, but oh well. Anyway, another solid episode. I do like how they made the equalizer more interesting. 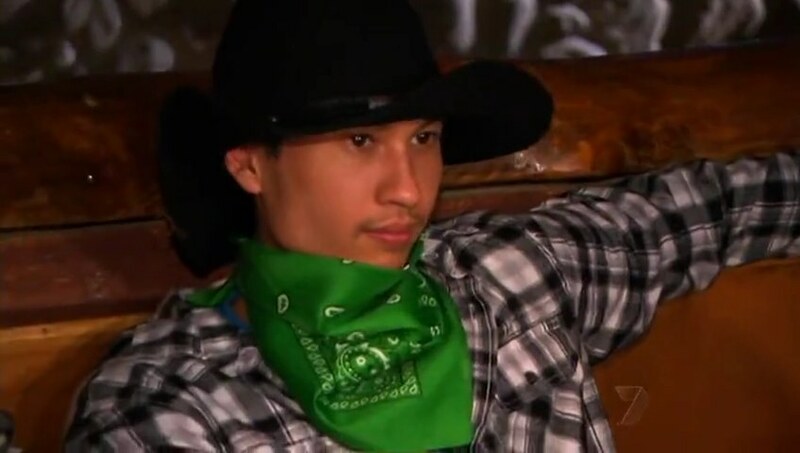 Since they had to wait until morning for the Road Block to open, having them take part in a little competition for an extra prize added a little fun and also could’ve even made some of the teams tired, affecting their Racing for the next day, depending on how long they stayed at the saloon. The Road Block was typical enough and the Detour was transplanted from a New Zealand leg in TARA3, but the extra Route Markers added more variety and excitement. Paul & Steve – Well, that was a horrible leg for them, highlighted (or low-lighted) by them hammering away at nothing at the ice task. It’s pretty bad when Michelle & Jo finish even before they figure out what they’re doing wrong. Their Detour misstep wouldn’t have been so bad had Lucy & Emilia not actually done what Paul & Steve failed to do. This isn’t the kind of performance they want heading into the final legs. Lucy & Emilia – Elimination finally caught up with them. It was only a matter of time. No matter how much fun they were having, as other teams went before them, they needed to step it up, but they seemed to be stuck in cruise control the entire Race. Too bad, because they were definitely a fun team to watch even if their Racing wasn’t up to snuff. Shane & Andrew – They are starting to step it up and that is a good thing. They definitely lived up to the bumbling cops title early in the Race, but they are definitely stepping it up when they need to. Now’s not the time to be fumbling through the Race. And they are certainly in a strong position to make it to the end. Joseph & Grace – Are they still in the Race?